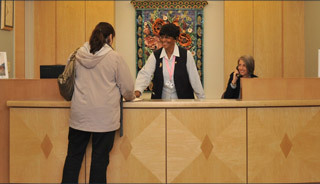 Our administrative staff supports the busy daily functions of the health system. As the first point of contact for our patients, our administrative professionals are essential to ensuring a positive patient experience. You’ll be part of a diverse team known for its compassion, positive demeanor, and commitment to making a difference. We offer rewarding administrative opportunities throughout our many locations in a broad range of settings including office, clinical, laboratory, research, nursing, and home care. Whatever the setting, you’ll play a key role in a fast-paced environment, using the industry’s latest technology.